Hosting this Thanksgiving? Chances are you are now racking your brains for modern holiday tablescapes ideas that will wow your guests, and more importantly, bring more meaning to all the things that you are thankful for. If you want to put an oomph to your dreary or plain dining room and transform it to a welcoming and vibrant space, we have come up with 15 modern Thanksgiving tablescape ideas to inspire you. Take a look at these gorgeous festive ideas. Own a clear-glass dining table and acrylic transparent dining chairs? Make your Thanksgiving celebration more luminous, classy and bright with tons of white and gold accent pieces and wares. Use gold-coated twigs as centrepiece to complement the clean and sleek look of the dining table, and don’t forget to use two white slim candles to brighten your space. Nothing will make your guests feel more welcomed than personalized tags propped on painted veggies or fruits. This simple design idea gives your table a more festive and personal look. Infuse elegance and charm into your table design and setting this Thanksgiving as you revel the year that has been. Use flute glasses and wares in warm, solid and transparent colors to bring in an old nostalgic feel. 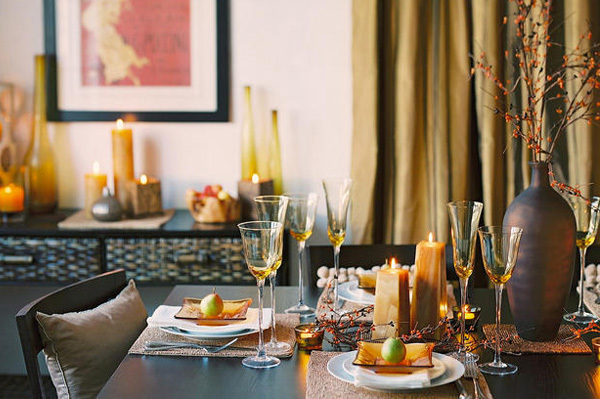 Make your Thanksgiving celebration homey and cozy by bringing in some colors of autumn into your dining space. Combine white with rich, dark brown to give an earthy look to your table setting. Use dried leaves as accent or center piece on your dining table. Complement your bright colored dining chairs and wares with autumn colors, and you’re all set to celebrate one memorable Thanksgiving with your family and friends. Add drama and flair to your dining space by combining the colors of gold and dark brown. This tablescape idea will surely make your guests feel more welcomed. Woven placemats, cloth napkins and candle holders in different shades of brown also give off nostalgic vibe. If you want a classy look for your Thanksgiving table, use dining wares and center pieces in black and white. This classic color duo will make your room and ambience brighter. Paint pumpkins in solid white and use linens with black and white patterns. Make this holiday more festive by using different hues of yellow and gold with your dinner wares, accent pieces and table linens. If you want a holiday tablescape idea that’s easy to achieve and visually stimulating, don’t scrimp on candles, glasses and rich, dried twigs, and vases in rustic colors. Bring the beautiful colors of Fall to your dining space by using flowers in rich, orange shade propped on white ceramic vases. Pair this bright color with patterned table linen and dinner ware in black and white. Brighten your table this holiday with the rich color of plum in your table cloths, votive candle holders and accent pieces. You might want to throw in some generous amount of white, bronze and gold to your plum-inspired table setting for a more relaxed look. Another inspiring tablescape idea is to use simple center pieces such as white pumpkin, thick white votive candles in clear glass holder, and decors in silver, white and bronze. Use black cloth place mats to make your wares and décor stand out. This modern Thanksgiving tablescape idea gives off a vibe that will make you and your guests cozy and comfortable. The warm colors of the room, wall art, and accent pieces make you feel grounded. 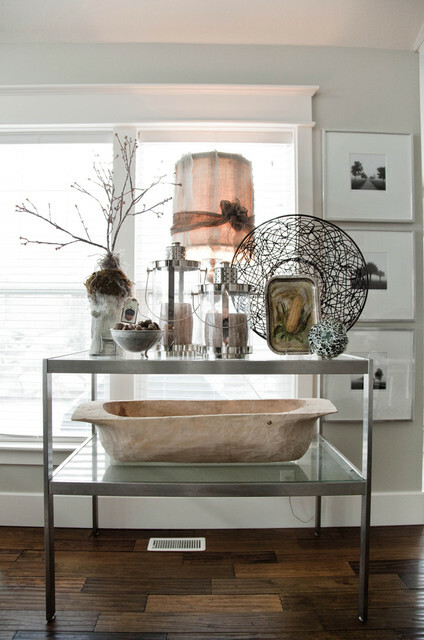 Add flair to your modern space with a Thanksgiving-inspired console table with lots of white and black décor. Lavish your dining space with the colors of autumn by bringing in some of the outdoors to your indoors. Exercise your creative flair with flower designs to complement your rustic-inspired dining tables.